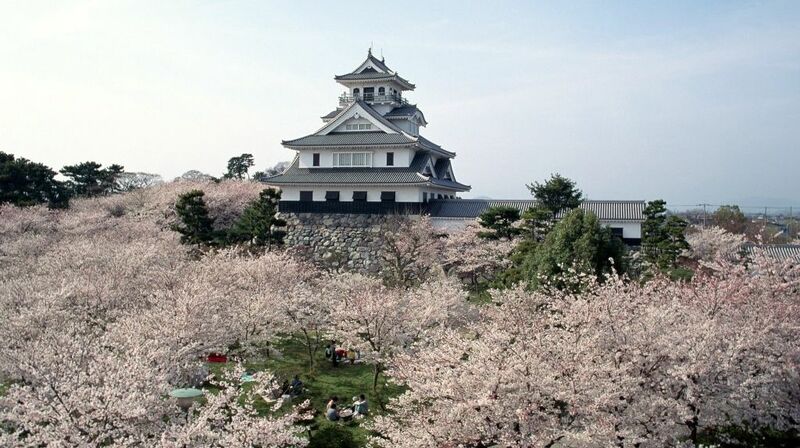 Nagahama castle is located in northern part of Shiga. The original Nagahama Castle was built by the local warlord Toyotomi Hideyoshi (1536-1598) in the 16th century for his first fief. The current Nagahama Castle was reconstructed in 1983. The fortress contains a museum with displays of historic firearms, samurai swords, roof tiles, photographs, telescopes and samurai armor. Nagahama Castle’s top observation deck affords good views of Lake Biwa on a clear day. From the beginning to the middle of April, about 800 “Someiyoshino” cherry blossoms burst into bloom around the Castle. It’s been designated one of the “100 best cherry blossom viewing spots in Japan”. You can see a layer of cherry blossoms from the castle tower. Cherry blossoms are lit up at night during the season. Access : 5-minute walk from Nagahama station on the JR Biwako line.